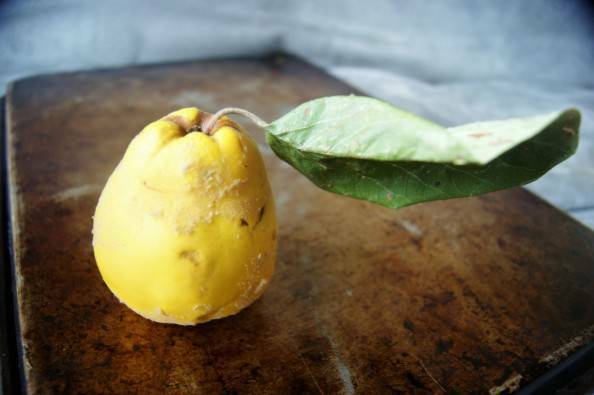 Quince is the kind of fruit that comes into the kitchen only to mock the cook. Their fragrance is mouth watering, their flavour otherworldly and utterly delicious, but they can apparently only be used to make paste and jelly. Whaaa?? Internet, you must do better by this queen of fruits. Quince are culinary stars that can and should be used in the kitchen in as many ways as possible while its brief season lasts. I have used quince to make membrillo, obviously, because it is literally the best thing to have on a cheese plate other than cheese. I have braised quince into a savoury Moroccan lamb tagine with delicious results. And this year was the year I learned how to make quince pie. QUINCE PIE! I feel transported by my success. Quince, as I hope you know by now, taste like apples that have been bathing with roses and guava and red wine; to be able to eat this fruit in pie form has made me so happy. 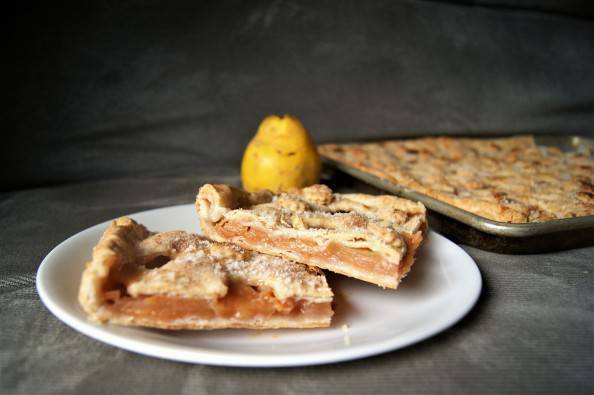 BUT, if you have ever worked with raw quince before, you know why making a quince pie is typically so difficult. Not only are quince are hard to come by (unless you are chef, in which case, everyone who has an old quince tree with fruit to get rid of stops by your door with an anonymous donation), they are notoriously difficult to peel and cut. Quince are rock hard, with a thick gritty core, defeating all but the sharpest knives and strongest arms. They also cannot be eaten raw. If only everyone knew to bake them first! Baking is the trick. I used it in almost every instance when I am dealing with quince. 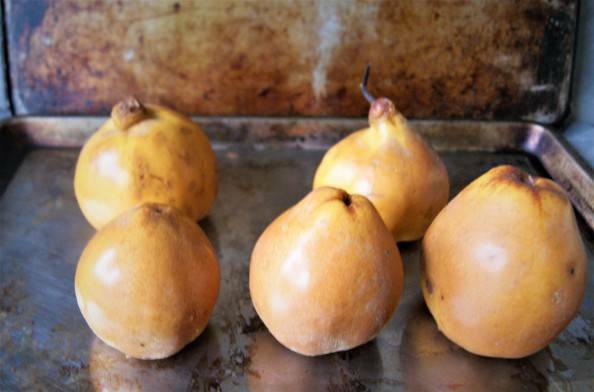 Bake the whole quince at 350°F for about 30 minutes; allow to cool, and then peel and slice the fruit with ease. One of my favourite cooking tricks ever. Once the quince have been baked, cooled, peeled and sliced, you can proceed to use them as you would use any fruit in cooking: pie, crumble, sorbet, tart. . . In this case, I made not just any pie, but a slab pie. Slab pies are my new favourite dessert. 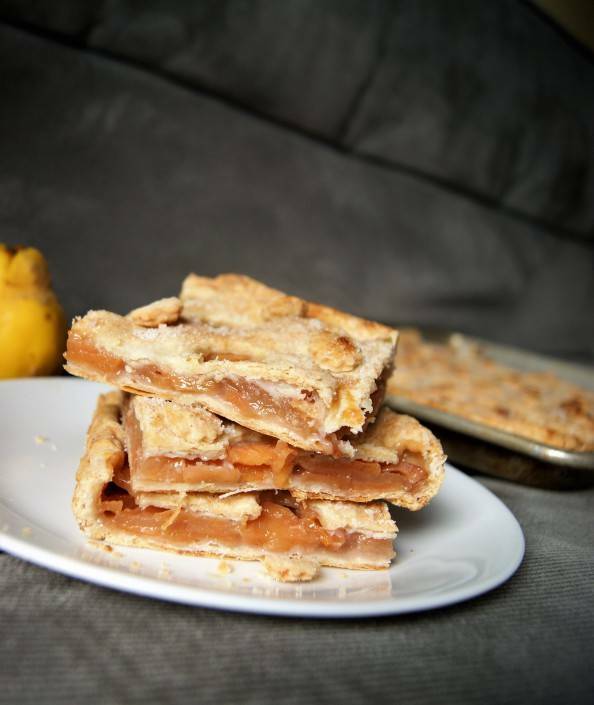 They have the perfect crust-to-filling ratio, are easier to cut, feed double the people of a regular pie, and use up a good amount of fruit (this last is an important consideration if, like me, you tend to bulk order a lot of foods), all for the same amount of work as a regular pie. 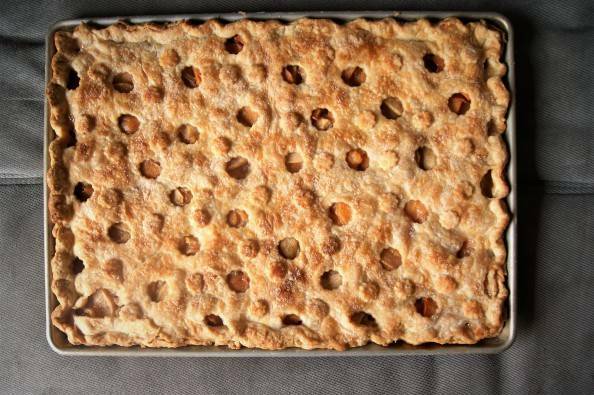 If you have no access to quince at the moment, make the pie below with any fall fruit mixture of your choice (apples, pears, persimmon, cranberry) and fill your kitchen with happiness. Slab pies are the new “it” pie: perfect crust-to-filling ratio, easy to cut and serve, and feeds double the people of a regular pie. Food processor method: In the work bowl of a food processor, combine the flour, sugar, and salt. Process for a few seconds to combine evenly. Remove the lid, scatter the butter pieces over the flour, replace the lid, and process again, using 4 to 6 one-second pulses. Add the lard and pulse a few more times, until the fat is cut into the flour properly. The fat pieces should range in size between small peas and cornmeal, with fewer large pieces and greater smaller pieces. But make sure to leave some large pieces and some dry flour, because these two things help with the flakiness. Transfer the flour mixture to a bowl. Toss with fingers to ensure an even balance of fat to dry flour. Hand method: In a medium bowl, combine the flour, sugar, and salt. Whisk to combine. Add the cold butter pieces and use your finger or a pastry blender to cut the butter into the flour. Rub the butter pieces gently between your fingers, coating them in flour, until they are half the size. Add the lard pieces and continue cutting in, until the fat is the right size, ranging in size from small peas to cornmeal. There should be more smaller pieces than big. To finish either method: Slowly sprinkle in the water, one tablespoon at a time, using a fork or rubber spatula to mix the dough. Stop after 10 tablespoons of water, no matter what the dough looks like. Turn the dough onto a counter. The dough will be very dry and crumbly at this point. Use your hands to gently gather the dough into a ball, using gentle pressure to make it hold together. Do not worry about over-handling the dough at this point. Encourage the dough with your hands to come together, and it will. If the dough is still too dry, sprinkle on a tablespoon more water and mix the dough with your hands again, until you can form it into a ball. In rare cases, you will need to use the final tablespoon of water. 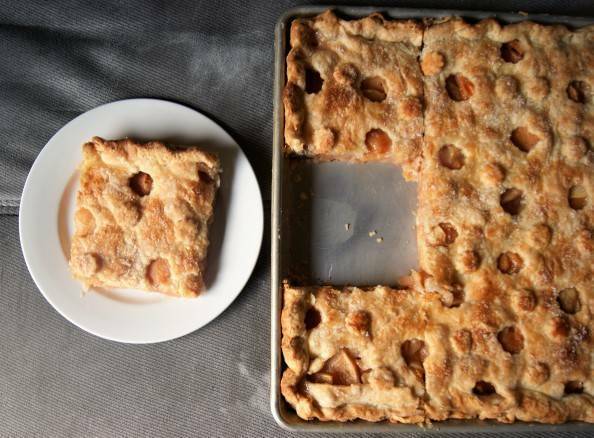 Divide the dough in two (one slightly bigger than the other) and form each into a flattened rectangle. This dough can be used immediately, or wrapped in plastic wrap and refrigerated or frozen for later use. To make the filling: Bake the whole quince at 350°F for about 30 minutes, until their skins look brown-ish, and the fruit has softened slightly. Remove from oven and let cool. 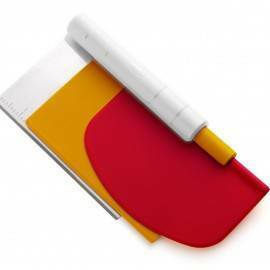 Rub or peel the skins off, then cut and core the fruit, and slice into thin crosswise slices. 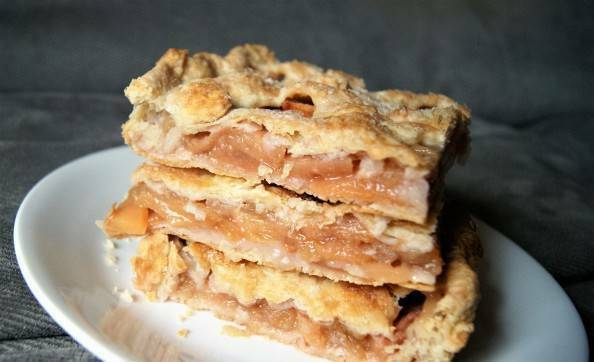 If using apples, peel, quarter, core and slice in thin crosswise slices. 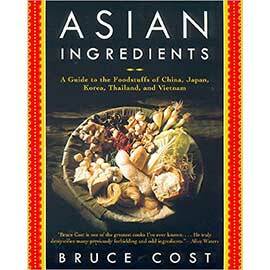 In a small bowl, whisk together the sugar, cinnamon, and tapioca starch. Set aside until ready to fill pie. (You don’t want to mix this together too soon, or the pie will be too runny). To assemble pie: Preheat oven to 425°F. Remove pastry from refrigerator. Roll out the slightly bigger dough on a lightly-floured counter top, using gentle even pressure, until dough is roughly a rectangle of about 12 x 17 inches. Transfer to a 10 x 15 inch baking sheet (AKA half sheet pan, or jelly roll pan). Don’t be alarmed if it is too big in some areas and not big enough in others. If necessary, trim off some excess dough and patch the lean areas (usually the corners). Trim pastry to edge of pan (keep these pastry trimmings, because you might need them to patch the top). Place in the fridge while rolling out the top. 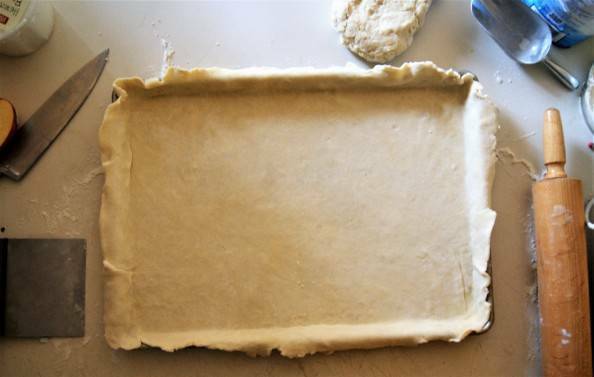 Roll the slightly smaller dough into a rectangle of roughly 11 x 16 inches. Cut vents in the top. 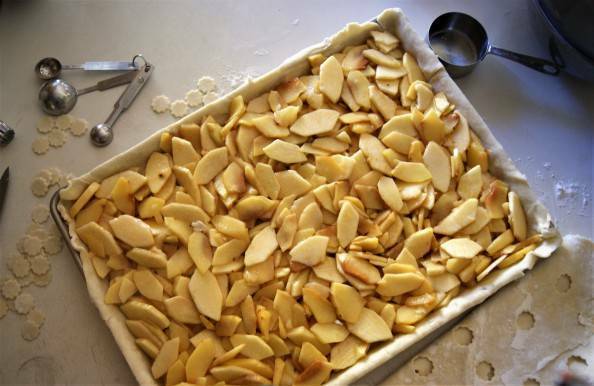 If desired, use a small cookie cutter to cut shapes in the top as vents. Now mix the filling: combine the prepared fruit with the sugar mixture in a large bowl and mix well to combine. Remove the pastry-covered sheet pan from the fridge. Fill with the fruit filling. Place top pie dough over, adjusting as necessary to center it. 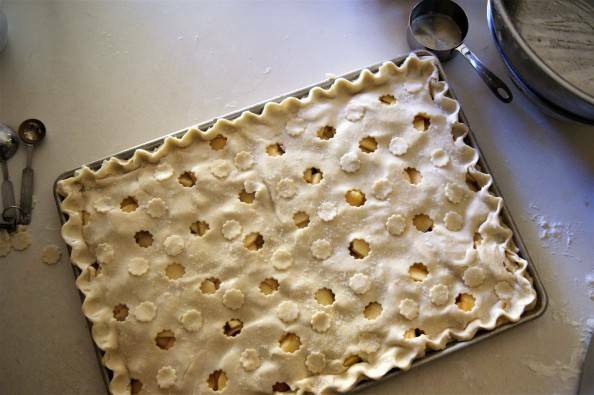 Fold the top crust under the edge to the bottom crust all around the edge of the pan, and pinch and flute to seal. Use trimmings from bottom crust if necessary to patch the top. Brush the top of the crust very lightly with water or egg white, and sprinkle with a tablespoon or two sugar or sanding sugar for sparkle. 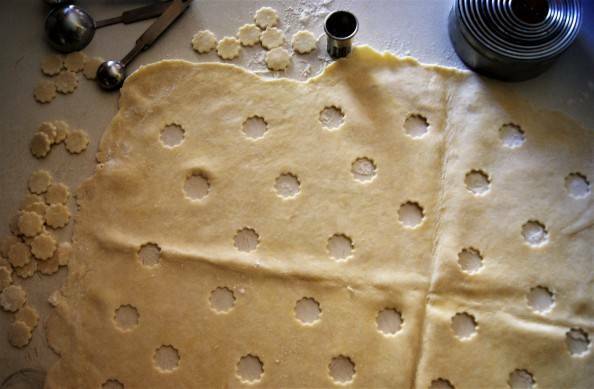 If desired, place cut-out pastry (from using the cookie cutter) in decorative pattern over the crust before sprinkling with sugar. 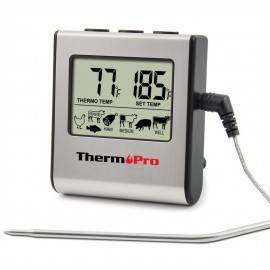 Immediately place in the bottom third of your preheated oven, and bake for 20 minutes. Rotate pie, reduce heat to 375°F and bake 40 to 45 minutes longer, turning pie again if necessary, until crust is golden brown and fruit is bubbling. Remove to a rack and let cool several hours before cutting and serving. I can attest this pie was deeeelish! FYI, one can also freeze and thaw whole quince to make them easier to work with. Not sure if this would work for pie, but works to make other quincey things, membrillo, jam, jelly, etc. I don’t own a 10 x 15″ pan. Can I use a 9 x 13 and keep the same amount of ingredients? Yes, you can, but the pie will be thicker. 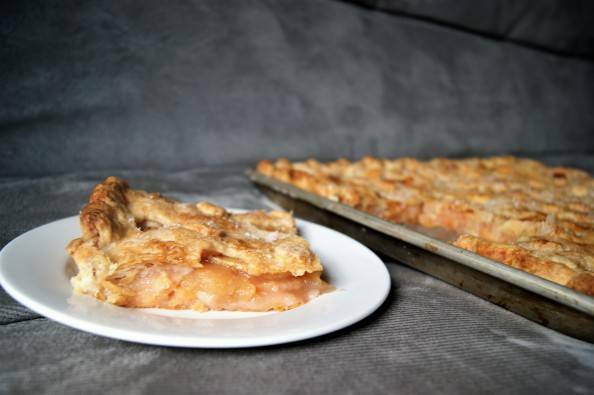 I made this slab pie from apples only this past weekend and it was a total hit. I agree the filling to pastry ratio is perfect. Thanks for sharing Heidi.